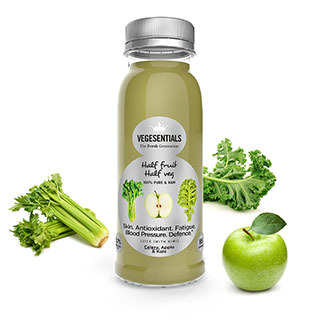 Light, refreshing and slightly savoury thirst quenching energiser. Ideal round-the-clock pick-me-up raw juice. Vitamin A contributes to the normal function of the immune system. Vitamin A contributes to the maintenance of normal skin, vision, mucous membranes. Vitamin A contributes to normal iron metabolism and has a role in the process of cell specialisation. Vitamin C contributes to the reduction of tiredness and fatigue, normal energy-yielding metabolism, and the normal function of the immune system. Vitamin C contributes to normal collagen formation for the normal function of skin, gums, bones and teeth. 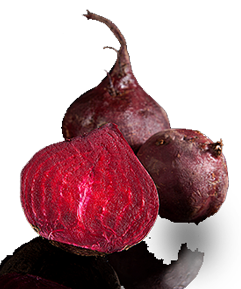 Smooth, textured strong earthy burst of vitality, ideal for any beetroot lover. Great option for an earthier raw pre-workout drink. – Natural Source of Vitamin A and Potassium. 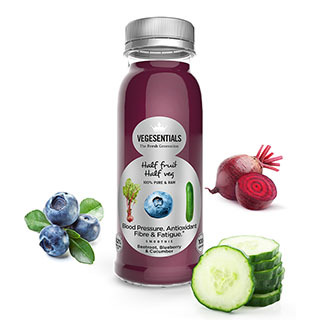 This drink provides naturally occurring Vitamin A and Potassium. Vitamin A contributes to the normal function of the immune system. Vitamin A contributes to the maintenance of normal skin, vision, mucous membranes. Vitamin A contributes to normal iron metabolism and has a role in the process of cell specialisation. Potassium contributes to the maintenance of normal blood pressure. Potassium contributes to normal functioning of the nervous system and muscle function. Fruity, refreshing and textured with a mild tropical twist. A less sweet option for the fruity palate. 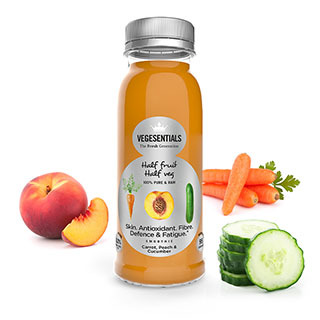 This drink provides naturally occurring Vitamin A and C. Vitamin A contributes to the normal function of the immune system. Vitamin A contributes to the maintenance of normal skin, vision, mucous membranes. Vitamin A contributes to normal iron metabolism and has a role in the process of cell specialisation. Vitamin C contributes to the reduction of tiredness and fatigue, normal energy-yielding metabolism, and the normal function of the immune system. Vitamin C contributes to normal collagen formation for the normal function of skin, gums, bones and teeth. Fruity, smooth and luxurious body tonic to kick-start any day. Perfect for your morning or mid-afternoon replenishment. 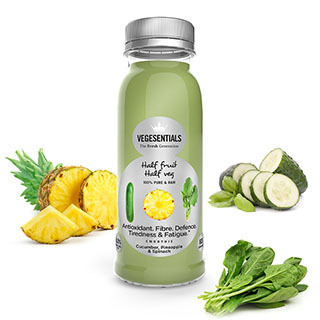 Refreshing, raw, green and fruity replenishment for any occasion. A perfect Breakfast Smoothie. This drink provides naturally occurring Vitamin C. Vitamin C contributes to the reduction of tiredness and fatigue, normal energy-yielding metabolism, and the normal function of the immune system.Vitamin C contributes to normal collagen formation for the normal function of skin, gums, bones and teeth. Deliciously raw and fruity combination of an earthy and tropical blend. A mildly earthy and refreshing winner for anytime of day. This Drink provides naturally occurring Vitamin C and Potassium. Potassium contributes to the maintenance of normal blood pressure. Potassium contributes to normal functioning of the nervous system and muscle function. Vitamin C contributes to the reduction of tiredness and fatigue, normal energy-yielding metabolism, and the normal function of the immune system. Vitamin C contributes to normal collagen formation for the normal function of skin, gums, bones and teeth. 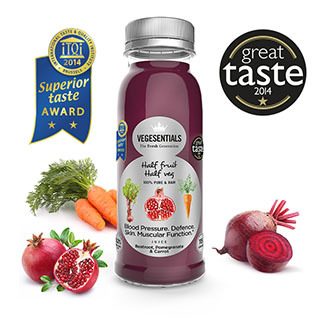 100% of the sugar, vitamins, minerals in Vegesentials drinks are naturally occurring from the fruit and veg.